It’s that time of year again and we have our bags packed as we are off to the Festive Gift Fair 2015 at the NEC. We had a great time last year entertaining the visitors with our jazzed up Christmas songs, just take a look for yourself, you might even spot a couple of familiar faces! With only 1 days to go until the doors burst open for the amazing Festive Gift Fair 2015, the NEC in Birmingham will be transformed into a colourful Santa’s Grotto with an array of Christmas present and gift ideas on show. Get caught up in the excitement of the day, experience the stalls with all the new gift ideas and also some amazing Christmas entertainment, there’s something for everyone! The Silk Street Santas might even make an appearance, keep your eyes peeled…! The Silk Street Jazz Band for your Christmas Party! What could be more festive than the Silk Street Jazz Band for your Christmas office party or family gathering? For Festive Christmas musical entertainment, the Silk Street Santas can be hired to jazz up your party which will have you and your guests dancing to Christmas classics all evening. 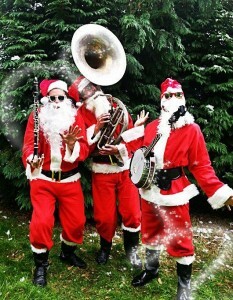 Listen to the Silk Street Santas here. To book any of our Acts or find out more, all you have to do is call us 0800 7565512 for some friendly advice or fill out our online enquiry form. Get your jazzed up Christmas off to a swing, with the Silk Street Jazz band!